One year has already passed since the massive earthquake and tsunami devastated eastern Japan. Even today, many people remain living in temporary housing set up in the disaster areas. Many others have been forced to leave the towns where they and their families had lived for generations. On the occasion of the first anniversary of this catastrophic event, we once again mourn the loss of so many precious lives and express our deep sympathy to those who have endured such tremendous hardships. April is the start of a new fiscal year in Japan and it is also the start of the cherry blossom season. 2012 is a special year because of the Japan-U.S. Cherry Blossom Centennial and to mark this occasion the Japan Foundation, Los Angeles, will be organizing a six city US tour of ABEYA Tsugaru Shamisen. In addition to this concert tour, we will also be commencing the spring term of JF Nihongo Courses. Finally, we just announced the new round of Japanese language grants available in the United States. We hope you will be able to come out to enjoy one of our upcoming events. We will be offering six courses for the spring term of JF Nihongo Courses. One of the more popular courses, Mastering Kana is an introductory course for novice learners. Everyday Japanese will be divided up into two different categories, one for Making Friends, which includes a review of Kana, and the other for Shopping & Dining. To develop professional skills for advanced learners, Business Japanese will also be offered. The spring term will start on April 21st. If you are interested in learning Japanese in the downtown Los Angeles area, please visit the JF Nihongo website for more information. A century ago, the city of Tokyo presented Washington, DC with a gift of 3000 cherry blossom trees that were planted around the Tidal Basin. These trees have flourished during the past 100 years and has transformed the appearance of Washington every spring, as a reminder of the strong friendship between our two countries. To celebrate the Japan - U.S. Cherry Blossom Centennial, the Japan Foundation, Los Angeles, will invite ABEYA, Japan's top Tsugaru-Shamisen Performance Ensemble, for a six city West Coast tour. The tour will kickoff in Los Angeles (4/9) followed by performances in Portland (4/12), Seattle (4/13), San Francisco (4/14), Denver (4/17), and Honolulu (4/19). We hope you will come out to support us for this historic occasion.. Note: We are also organizing a workshop in Los Angeles at UCLA (4/10). This is a friendly reminder that the 2012 JET-MIP application deadline is quickly approaching. Please note that all applications need to arrive at the Japan Foundation, Los Angeles, on Friday, April 13th, 2012. We will not accept applications that are late or are sent to the wrong office. Please also remember to include a copy of the applicant’s NJE results. For more information, please. In Mid-March, we announced the start of several grants that we organize annually in support of Japanese-Language Education in the United States. These include the Grant Program for Contests Designed for Japanese-Language Learners (2nd Deadline: 9/1/2012), Japanese-Language Teaching Materials Purchase Grant (2nd Deadline 9/1/2012), Grant Program for Japanese-Language Courses (Deadline: 5/2/2012), and Japanese-Language Education Grant (Deadline: 2 months prior to project start date. If you are interested in applying for any of the grants mentioned, please Click Here to read about all our Japanese-Language Grants. As reported in the previous issue, the Japan Foundation has setup a website allowing users from all over the world to leave a message of support and design a virtual fireworks display for the people who were deeply impacted by the Great East Japan Earthquake in 2011. We are still collecting messages and fireworks designs from all over the world so please take a minute and create a message for the people of Tohoku. This may be a good exercise for beginner and intermediate Japanese language learners, which will allow them to practice writing basic messages in Japanese. This month, we have invited Takashi Miki, a teaching assistant at Waddell Language Academy in Charlotte, North Carolina, and Sayuri Ogiuchi, a teaching assistant at Jefferson High School North in Lafayette, Indiana, to share their experiences at American high schools. As you may recall, we sent 15 Japanese teaching assistants to assist Japanese-language teachers at select high schools all over the country. Each month, two participants will report on their experiences. Dr. Yasu-Hiko Tohsaku, who is a Co-President of American Association of Teachers of Japanese, said that at a local conference of Japanese teachers. At that time, 6 months had passed since I started to work at Waddell Language Academy and my thought about my role in immersion program had been changing, so I was very impressed by his word, which made me realize something important. Hello, everyone! My name is Sayuri Ogiuchi, and I work as a teaching assistant at Jefferson High School in Lafayette, Indiana. Let me introduce you to our cool city, our awesome high school, and above all, our fun Japanese classes. Lafayette is a town with a population of about 67,000 people, with a historic downtown area and international companies like Subaru. You can find nice handmade crafts because many artists live here. West Lafayette is just over the Wabash River, where Purdue University is located. Lafayette and West Lafayette are called the “Twin Cities” where you can enjoy both the history and beauty from the past as well as the youth and energy of the future. This is the last part of an eight part series that will highlight the experiences of 32 participants of the 2011 JET Memorial Invitational Program. 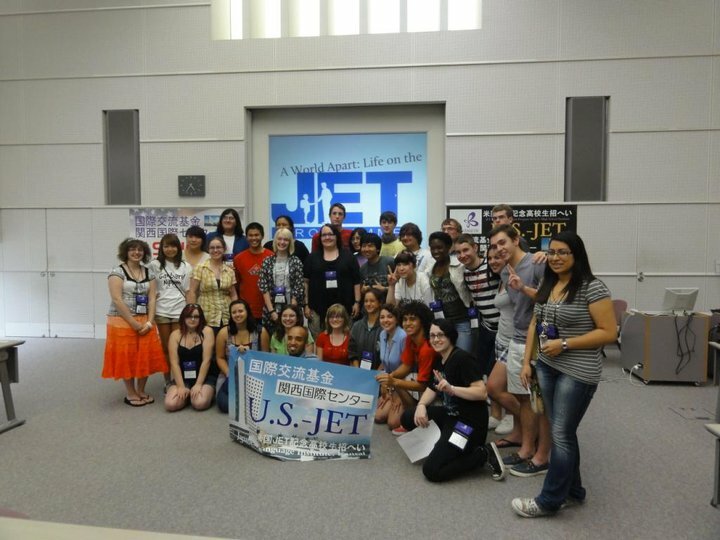 Through this program, participants travelled to Japan in July of 2011 for a 10 day exchange that focused on Japanese language and culture with the purpose of fostering friendship and goodwill between the youth of both countries. This month, we will be featuring the last essay of the 2011 JET Memorial Invitation Program by Brettley Ross. The 2012 JLPT will be held on December 2nd, 2012. We will not be offering the July test in the United States and only the Alberta test site in Canada (Deadline: April 6th) will be offering the July test in North America. For more information including cost, test sites, and registration process, please visit our website again in July. Japanese language enthusiasts gathered together at the JF Nihongo classroom in Little Tokyo on Saturday, March 24th! From beginners to advanced learners, more than 30 people enjoyed themselves chatting with Japanese native speakers in either Japanese or English over green tea and Japanese snacks. "Why do you learn Japanese?" "Which city did you visit in Japan?" --The topics ranged from travel to Japan to favorite Japanese food. Participants also enjoyed a fun Japanese word game about Japanese food such as Oyako-don, Kappa-maki and so on. Attendees were very receptive of this event and made the following comments: "Thank you for providing this opportunity", "Best Japanese event I have been to", "Enjoyed the refreshments all from Japan". This is the first event we organized as a part of the JF Nihongo language courses. Many of attendees were interested in the courses and some registered there as well. We are planning for the next Tea Time and will announce it on our website. If you were not able to make it this time around, we hope you can join us next time! We are giving away about 200 books for free. To view the list of books and find out how you can get them, please see How to Request Free Books and Free Book List. The Nihongo Library will be closed from May 1, 2012 until this fall due to the relocation of the office and library to the Mid-Wilshire district of Los Angeles. The library will suspend check-out service on April 20, 2012, and ALL borrowed materials must be returned to the library by April 30, 2012. We will announce the reopening of our library on our website so please check back periodically for updates.